To read up on what happened, check out the report: Quest for Jackie Chan – what a day! The Quest for Jackie Chan is on, and the instructions are now available! Maria’s journey has already started and she’ll be in Adelaide this weekend. To get involved, just come along on the day with a Jackie Chan mask and a print out of the instructions. It’s going to be a blast, so bring your friends! Read the instructions by hitting the ‘more’ button! QUEST FOR JACKIE CHAN INSTRUCTIONS!!! CLOTHES: wear blue jeans and a black tank top/t-shirt (or as close to that as you can) we’ll have some masks for people on the day, but if you could print your own, that would be great! 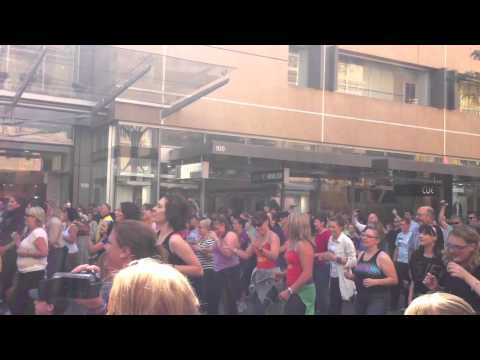 First, meet at Hindmarsh Square where we’ll briefly run through the mobs as there are going to be a few new people to this event, then we’ll head to Rundle Mall for the rest of the activities. Mob # 2: Follow that Chan! Keep an eye out for the leader who will pick someone walking down the Mall and we’ll ghost them. Stay alert, because we’ll be switching people/direction a few times. We’ll finish out the front of the Myer Centre where we’ll all disperse for our next mob. Mob # 3: Shopping Chan-nel: Do you have night vision goggles? Head into the Myer Centre (masks off) – we don’t want to spook the security guys. Head to AUSTRALIAN GEOGRPAHIC in SMALL GROUPS OR PAIRS on the ground floor. Wander around the store and talk to each other while looking around, getting louder and louder. By the time everyone is in the store, it should be really loud. Keep an eye out for Ben, who will go to the front counter and ask “Do you have any night vision goggles?” (they don’t), when the say “no” we’ll all suddenly go quiet, put our masks on, stare at the shop assistant and walk out of the shop, and head to the front of the Myer Centre and disperse for the next mob. Disperse around the front of the Myer (masks off), we’ll be on the move, so try to keep an eye on where everyone is, but make sure you have enough distance so we don’t draw attention to ourselves. Keep an eye out for people taking photos around the Mall (usually around the Mall’s Balls or the Pigs) once we see someone setting up for a photo, we’ll quickly rush in, put on our masks and join in on the photo, making V (peace) symbols with our fingers. Finally, head to the City Cross food court for food! !